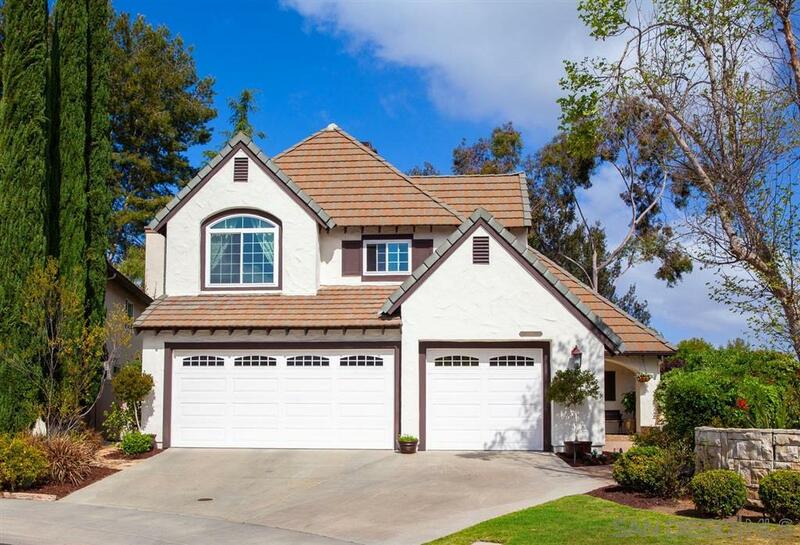 $819K-$849K Remodeled English Tudor in the gated story book community of Royal St Georges w/mountain views on a cul-de-sac. One of the largest lots in the neighborhood. Immaculate former model home w/open floor plan, natural light & extensive upgrades. Beautifully remodeled gourmet kitchen. 1st floor master retreat w/remodeled ensuite. 3 gas fireplaces. Private backyard w/ multiple entertaining areas including pergola, stone patios, & fountain. 3 car garage w/bonus room. Community pool, playground & more., $819,000 - $849,000 Completely remodeled English Tudor located in the gated story book community of Royal St George's in Carmel Mountain Ranch with mountain views. Nestled on a family friendly cul-de-sac, this meticulously landscaped home boasts one of the largest lots in the neighborhood. The immaculate 2,141 sq. ft. former model home has an open floor plan, abundance of natural light, and extensive upgrades. The beautifully remodeled gourmet kitchen features granite countertops, travertine tile backsplash, wood cabinetry with soft close drawers & doors, stainless steel appliances, Wolf gas range, breakfast bar, bay window, & walk in pantry with extra storage. The spacious 1st floor master retreat with cozy fireplace has its own patio & a remodeled ensuite with soaking tub & separate shower with travertine tile. The upstairs family room (optional 4th bedroom) has custom built in bookcases & granite countertops. The spacious secondary bedrooms also have built in bookcases & a walk in closet in the 2nd bedroom. French doors lead to the serene backyard with a pergola & cobble stone patio for outdoor dining with a covered BBQ & tranquil fountain. This fully fenced pie shaped yard features multiple entertaining zones & grass yard with mature trees behind it for additional privacy. The 3 car garage has a Bonus Room for office/exercise/play or teen room, ample cabinet & overhead storage along with attic space above 3rd car garage with shelving units. Upgrades include 3 gas fireplaces, marble tile in formal entryway, laminate wood floors, soaring 20' vaulted ceilings, arched entryways, new Anlin dual pane windows, recessed lighting, ceiling fans in all bedrooms & bonus room, 5" baseboards, new custom paint, plantation shutters, whole house intercom, central heat/AC, & sprinkler system with drip irrigation. The community features a heated pool, kiddie pool, hot tub, BBQ's, basketball court, & playground. No Mello Roos. Award winning Poway school district. Close to Carmel Mountain Ranch Rec Center & freeway access. Don't miss the opportunity to own this rarely available custom home in this charming fairy tale community.